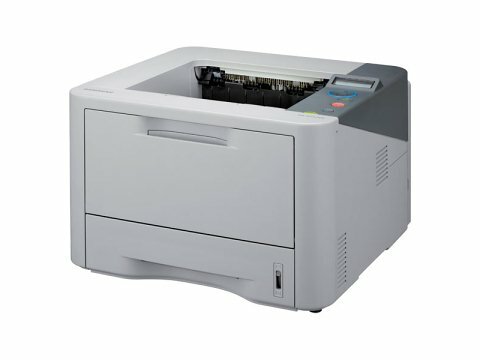 The compact Samsung ML-3712ND is ideal for busy offices with high-volume printing needs. This small unit is capable of printing 80,000 pages per month and comes with built-in duplexer. For connectivity, an Ethernet port is available. The ML-3712ND monochrome laser printer is quick and delivers solid print quality from black and white text documents to greyscale graphics. The only trouble with the Samsung ML-3712ND is that toner costs can escalate without a cheap supplier of the cartridges. The high-performance Samsung ML-3712ND printer has a cube-like form, with an output tray on top and paper trays at the bottom. The control panel is on the right side and consists of function buttons and a monochrome LCD display. The Samsung ML-3712ND black and white laser printer has a maximum paper handling capacity of 820 pages. Print speed can go as fast as 35 ppm with the first page coming out in 6.5 seconds. With the eco-mode, offices will have lower energy consumption. The Samsung ML-3712ND mono laser printer also has a duplexer for automatic double-sided printing to reduce paper waste in half. Workgroups can easily share the ML 3712ND as it has built-in Ethernet and it offers support for Macintosh, Linux, and Windows computers. The Samsung ML-3712ND printer has a small foot print making it easy to fit in the office; it only measures 14.4 x 14.5 x 10 inches. The replacement Samsung ML3712ND toners are quite expensive but an extra high capacity ML-3712ND black toner is offered for better value. Also, the Samsung ML-3712ND monochrome laser printer does not have Wi-Fi.